Above: ”Black Iron Ursa” was made using Singularity Black paint. SOMERVILLE — That the gummy bear was an artwork was unusual. That the gummy bear was so black that it looked like an optical illusion was really unusual. Welcome to the world of Singularity Black. “Black Iron Ursa,” a painted sculpture, doesn’t reflect light, making it difficult to see its ears and paws. Because the human eye is trained to look for light, it is disorienting and somewhat painful to look at. “Black Iron Ursa” was the brainchild of Somerville artist Jason Chase, who watched baffled visitors stare at the object in his studio on a recent Sunday afternoon. 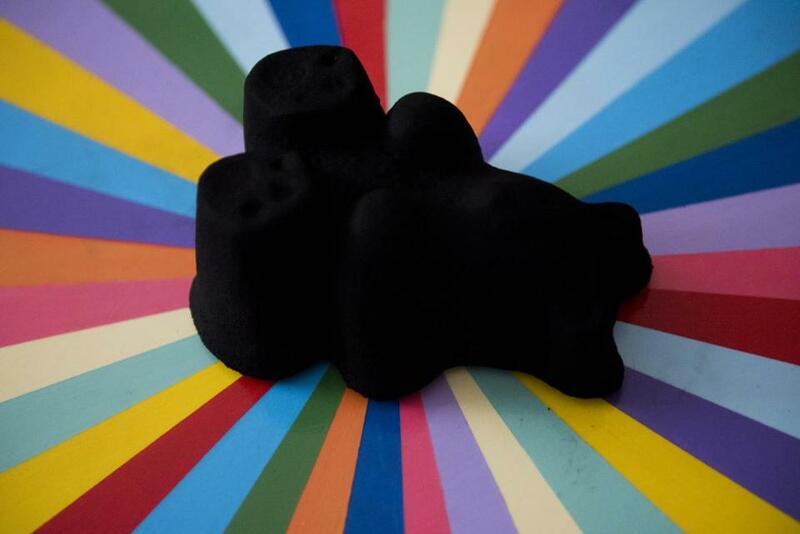 Made from cast iron, the gummy bear was coated in Singularity Black, a carbon nanotube paint developed by Waltham-based NanoLab, Inc. The paint absorbs over 99.9 percent of light, making three-dimensional objects look two-dimensional. Chase built a colorful wooden carousel to display the bear on, making the bear’s blackness even more striking. A small glass dome covers the artwork to protect it. The “blackest black” paint has been a point of contention in the art world since 2014, when British artist Anish Kapoor received exclusive rights to working with Vantablack , a pigment created by a British company, Surrey NanoSystems, that absorbs 99.965 percent of light. Now Chase is hoping that Singularity Black will put the whole squabble to bed. NanoLab created Singularity Black at NASA’s request in 2011. The agency frequently sends equipment into space to measure faint stars, and they wanted a pigment that would absorb stray light to keep it from interfering with sensors. Its name was inspired by the center of a black hole, where the known laws of physics stop operating. Carbon nanotubes excel at trapping light, so the lab combined them with a binding agent for stabilization. After the pigment is applied to an object, it has to be heated to 600 degrees Fahrenheit, which eliminates the binder and leaves the carbon nanotubes in a porous arrangement for maximum light absorption. Preston had met Chase in a Drawing in Pubs class, so he e-mailed him as soon as NanoLab had successfully developed Singularity Black into a paint. Chase, who is primarily a painter, had been working with renderings of gummy bears for a while. He made the cast-iron gummy bear a while back, during a workshop, so he dug it up and brought it to the lab for a paint job. The artwork will be displayed at Laconia Gallery , in the South End, starting Aug. 24. Artists can buy Singularity Black off the shelf. They can apply the paint themselves after a tutorial from NanoLab, according to Preston. He estimated current price to be in the low to mid-hundreds of dollars for 250 milliliters to 1 liter of paint. Colorado sculptor Sean O’Meallie said he is intrigued by the material. He said Singularity Black opens up possibilities of doing something different and challenging. However, there are limitations to how Singularity Black can be used. It can only be applied to metal surfaces, so Chase is experimenting on copper plate. He said he wants to juxtapose traditional mediums, like oil and gold leaf, with this futuristic paint. Preston said NanoLab has already received multiple inquiries from artists interested in getting the paint. Chase said he intends to curate an art show of Singularity Black pieces as soon as there is a collection. View “Black Iron Ursa” at Laconia Gallery on Aug. 24 at 7 p.m. 433 Harrison Ave.
Bethany Ao can be reached at bethany.ao@globe.com. Follow her on Twitter @bethanyao.